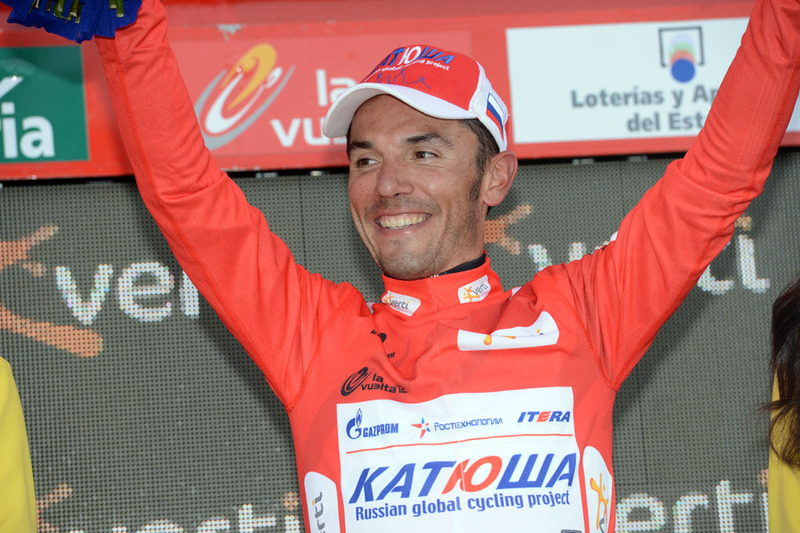 Finally – finally – a break was allowed to contest the finale of a mountain stage, with Antonio Piedras of Caja Rural making the most of the day pass issued by Katusha, Saxo Bank and Sky, who helped up the tempo as the final climb approached. So, a break of 10 riders arrived intact at the foot of the last climb of the day with a 13 minute lead, the gruesomely steep 13.5 kilometre Lagos de Covadonga. With the bunch dawdling, relatively speaking, the stage winner was going to come from the breakaway and it was Piedras whose attack near the start of the climb stuck. The 26 year old won the stage with a lead of still nine minutes over the best of the lead group. Clearly it was the best win of his career. Behind, there was something of deja vu about the stage, as Sky – in the shape of British road champion Ian Stannard and Juan-Antonio Flecha – who wound up the bunch into the bottom of the climb before Saxo Bank took over on the climb proper. Their pace was so fierce it was as though a bomb had gone off in the middle of peloton and within a three kilometres there was a select lead group of less than 30 riders and it was thinning fast. Hernandez and Navarro attacked off the front of the group – presumably to set up Contador further up the climb – and there were a flurry of attacks, which saw race leader Rodriguez’ Katusha team mates go to the front to control and calm. Inevitably, Contador attacked. Inevitably, Rodriguez countered and closed the gap, chased and joined by Alejandro Valverde (Movistar) wearing the green jersey of points leader (although it is Rodriguez who leads the classification). Behind, Chris Froome (Sky) was in trouble, unable to respond to the vicious accelerations of the Spanish trio in front. Although Froome had Colombian duo Roberto Uran and Sergio Henao to help pace him, Froome looked tired and struggled to match the pace of his colleagues on the steeper sections of the climb. Maybe two Grand Tours a year is one too many for the British rider? In front, Contador attacked no fewer than five times and each and every effort was countered by Rodriguez, riding without backup or aid from any of his team mates, blown away by Contador’s incessant efforts. Valverde was slower to react than Rodriguez but, aided by his Colombian team mate, 2010 Tour de l’Avenir winner, Nairo Quintana he never really looked to be struggling, while Froome toiled 40 seconds behind the leading general classification trio. In the final charge to the line, it was Valverde who finished the best of the general classification contenders in 11th, but for once it didn’t really matter, since the time bonuses were long since gone and you could have thrown a (small) blanket over the trio on the line. What did matter was that Froome finished the stage 35 seconds behind Valverde and Co. ceding his third place overall on GC to former drug cheat Valverde. It’s hard to see anyone shaking the leading trio now. 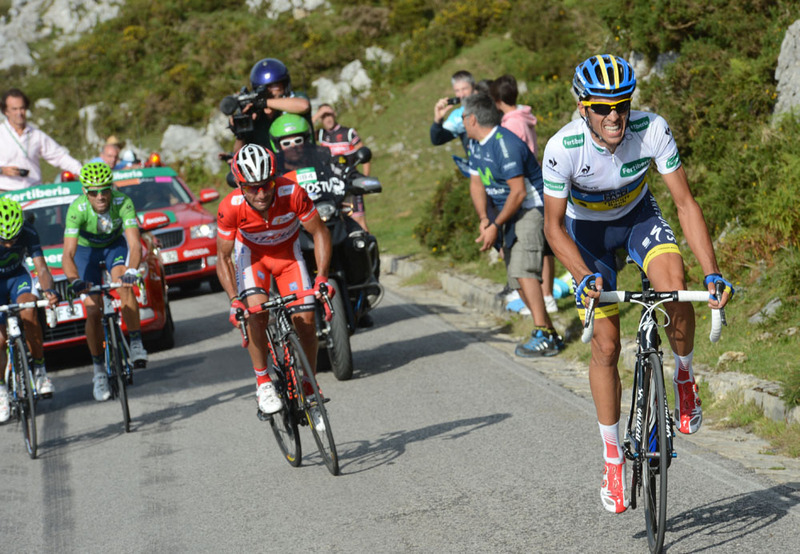 All we can say for certain is that Contador will attack again. (And ‘J-Rod’ will counter).